If you saw my recent post from Dollar General, you already know that they carry high quality health and beauty products for the family. What you might not know, is that Dollar General doesn’t just carry health, beauty, grocery, and cleaning products. 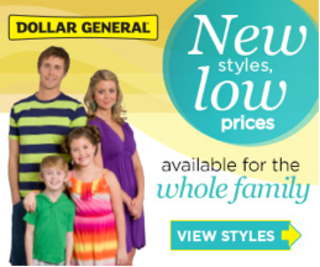 They also carry a great selection of Spring apparel for men, women and children at affordable Dollar General prices. I recently took a look through the latest Dollar General Apparel Book. There are super cute options for everyone! Workout clothing, cute Spring fashions, swimwear, dresses, children’s clothing and all of the accessories that you need to make your outfit fashionable for the Spring and Summer months ahead. Swimwear for the whole family. For the children who love characters, look at that minnie mouse swim suit! Absolutely adorable. My little girl would fall in love with the princess swimsuit and probably want to live in it. Grab your swimwear, sun protection, Spring apparel and even a big floppy hat at a great price! So many of my friends are pregnant right now, and everywhere I look there is someone announcing a new arrival! Spring and Summer months are the most common times to attend baby showers. Imagine what you could give your friend as a baby shower gift at affordable Dollar General prices. Fisher Price infant apparel, baby accessories and even baby necessities, you could create your whole baby shower gift in one top. I love shopping for baby stuff at Dollar General, great finds and all without breaking the wallet. Sometimes, simple is better. Simplicity, affordable and convenience is what I find when I go into Dollar General.